1976: YEAR OF CONFLICTING POSSIBILITIES BY D.R. O’Connor Lysaght. It was not, to paraphrase Frank Sinatra, ‘a very good year.’ Nor was it as bad as some of the years of the’80s and ‘90s. It was, rather, a year in which the reordering of world politics proceeded towards the creation of what would be termed ‘a New World Order’ to replace the balance of forces in the Russo-American Cold War. In that war of manoeuvres, Keynesian liberal capitalism had maintained itself and bought off any rumbling from its home workforce by relying on the super-exploitation of the workforce in its colonies. It saved money on these colonies’ consistent policing by making them into semi-colonies under native collaborators. Against it, the stalinised workers’states matched, often more than matched their opponents’ welfare provisions, negated these reforms by their suppression of civil liberties, including those specifically of oppressed nationalities. This oppression made it increasingly difficult for them to match the technical innovation of the imperial metropoles. Both blocs found themselves increasingly in debt, from trying both to maintain living standards and arms spending. The crisis in the workers’ states had begun earlier. It had not been noticed or else had been misunderstood by their opponents who saw the threat to the bureaucracies as coming from their oppressed subjects, though this ( and their suppression) was only a contributory factor to the mountain of their debt. The capitalist crisis was more traditional but less obvious. Whereas the Stalinised states faced a crisis of under-production, their opponents faced a series of mounting crises of over-production. To keep its profits, capital began to move part, sometimes all its means of production to the semi-colonies where labour power was cheaper and productive forces unregulated. The imperial metropoles became increasingly dependent on finance capital, but this was not enough. Like the bureaucratised workers’ states, the imperialist powers spent money on military and intelligence initiatives, often more subtly than their opponents, against satellites of their central powers that might get out of hand. The Soviet Union suppressed in this way Hungary and Czechoslovakia. The USA suppressed Guatemala, Iran, Indonesia, San Domingo. By 1976, it had crushed Chile, though the Soviet bloc had driven it from Vietnam, Laos and (something of an own goal) Cambodia. These victories were ensured partly by the courage and skill of the people of the countries concerned but also by a political crisis in the oppressor state. The more fundamental crisis that shook the inperialist world came in 1974, when the oil producing powers raised the price of their commodity. This would not have made such an impression had other aspects of the imperial economies been healthier. As it was, it strengthened tendencies already existing within the camp to end the Keynesian consensus one way or another. By 1976, the signs of the future can be seen to be present. In Britain, James Callaghan succeeded Harold Wilson with a last ditch attempt to revitalise social democratic policies within the imperial capitalist environment, but Margaret Thatcher lay in wait as leader of the opposition. In the USA, President Gerald Ford’s relatively moderate Republican policies were defeated by the election of his successor, the Democrat James Carter, but the successor to both of them, Ronald Reagan, had already nearly won the Republican nomination and, possibly, the White House. In the Catholic Church, the future Popes, John Paul II and Benedict XVII were already Cardinals. Overall, imperialism was preparing to move right. This was covered partially by its acceptance of some retreats, notably in Vietnam, but also in Spain, where Franco’s dictatorship could not be maintained after the death of the man himself, and in Portugal where another dictatorship had fallen to an unexpected revolution which imperialism had yet to housetrain. In Latin America, the Panama Canal had to be returned to the people of Panama. In the Middle East, the Judaic-American garrison of Israel was having to consider surrendering the lands it had recently grabbed from Egypt. Nonetheless, globally, these were minor adjustments acceptable to the propertied classes in the overall scheme of things. Against them in different degrees was an heterogenous group. Much of its subsequent failure can be seen in the fact that what were still its largest political interests, the Social Democrats and the Moscow line Communists ( together including most trade union leaders) were on its right. In general, both these saw the way forward as being one of propping up the existing order, Keynesianism in imperialism and what the CPs saw as ‘actually achieved socialism’ in the workers’ states, with both sides contesting for the support and the resources of the peoples of the semi-colonial world. British Labour had been put into power with its most radical programme ever to win an election, but it remained tied to its debt through the city of London. The continuing hegemony of Social Democrats and Stalinites provided poles of attraction diverting activists from the revolutionary way. At the same time, activists were deterred from taking this path by the fact that it was composed of many contradictory ways. There were still several Maoist organisations in each country, committed to forms of the great helmsman’s radical version of Stalinism, there were the Trotskyist organisations, there were post-Trotskyist organisations, particularly in Italy, inspired by the Risings of 1968, there were Anarchists. Unity on specific actions was possible and often achieved, but could not be maintained even within specific ideological groups, partly because, in the Trotskyists’ case particularly, such unity had to be forged between international organisations. (Though the Maoists had the advantage of an acknowledged base, the members thereof showed little interest in international unity or, even, co-ordination.) Meanwhile, the regressive forces were, of course, richer and, though often in disagreement, they never let their tactical squabbles distract them from their main programme, that of maximising profit at the expense of the working peoples of the world, a task simpler, anyway than that of revolution. The overall situation in Ireland was complicated by the fact that the island is part semi-colony, part colony and, geographically in a postion to benefit more than most colonised entities from its closeness to the imperialist metropoles, if only to make it easier for its inhabitants to emigrate. Class differences are less intense than in other colonised countries. At the same time, the way to working class revolution is not blocked only by the small Labour Party or the tiny Communist Party but by Republicanism, a large revolutionary movement with its perspective centred on completing what remains of the bourgeois national revolution cut short in 1921. 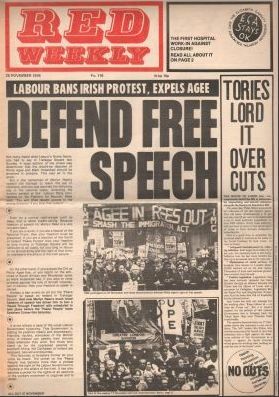 By 1976, the movement had accepted the need to build support by incorporating some socialist ideas into its programme and organising politico-social mobilisations, but these moves had provided cause for it to split. There were now three main Republican bodies, each with political and military wings: the traditionalist Provisionals, the Officials with a political perspective influenced by Moscow and increasingly reformist, and its breakaway, the small Irish Republican Socialist Party, which came nearest to the organisations of the far left, unlike the two big ones, as it recognised the struggle as being one of thirty-two counties. As elsewhere, the left bodies included Maoists and Trotskyists, divided by their international organisations but also by their attitudes to the democratic tasks. Quite apart from the constraints of space, the writer can comment in detail only on his own organisation, then called the Movement for a Socialist Republic (It had changed its name from Revolutionary Marxist Group the previous year which may have improved its image or just confused those whom it was trying to attract). This group was, as its heir is still, affiliated to the largest Trotskyist Fourth International. The MSR worked most closely with the People’s Democracy, bonding in a common recognition of the central importance of building a mass movement to unite Ireland. 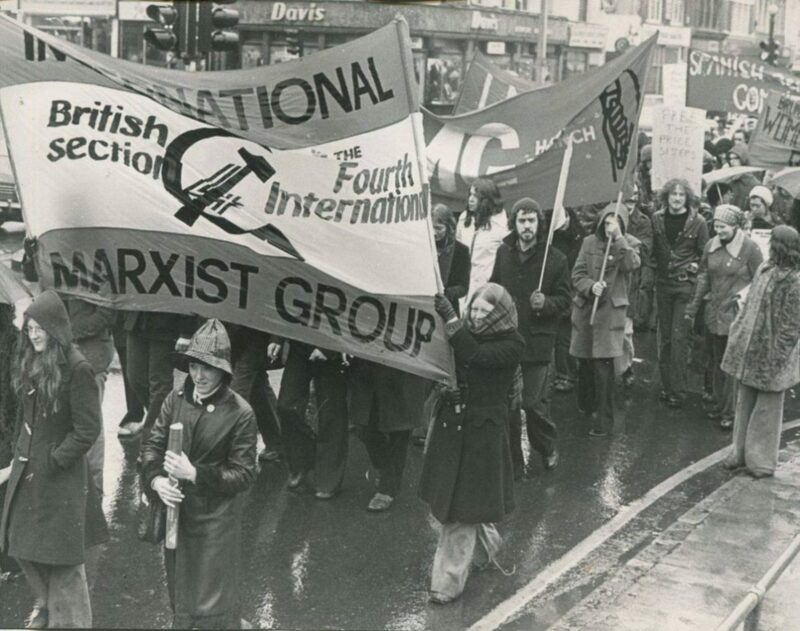 (The two organisations would unite formally in 1978.) They agitated against the increasingly repressive policies of the regimes north and south, most notably preventing the execution of the Murrays (and blocking any such executions in the last forty years.) Socialist Democracy helped organise a seminar on the diamond jubilee of the Easter Rising, the only celebration of that event. Their weakness lay in the industrial sphere where mass unemployment inhibited militancy. Matters have not changed so much in the last four decades. The triumph of neo-liberal capitalism over stalinism, and over keynesianism has exposed its own weakness. To maintain itself, capital is moving to distract attention through xenophobia and religious fundamentalism, while insisting that economically there is no alternative to itself. The left is less divided and less inclined to trust the fakirs of Stalinism and social democracy, but still punchdrunk from constant defeats. Whether principled unity is possible is doubtful. It is certainly necessary. ← Pat Murphy and Eddie Collins members of the Cork Volunteer’s Pipe Band, attending the 1954 Wolfe Tone Annual Bodenstown Commemoration.